This fine initial 'R' and the 'spiky' script are typical of the high quality work produced at Canterbury in the early 12th century. 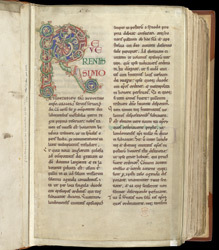 The initial is formed of an open-work frame, around which foliage coils, with a dragon for the curving right-hand limb. Within the initial itself a bald, bearded, man grabs hold of the back, and back leg, of a hare (? ).